Based on market research done by GfK, we know that one of Columbus’ reputation pillars is that it is a green and clean community. Though a vibrant, urban destination, 253 acres of greenspace in downtown Columbus alone allow for an easy escape to nature when attending a meeting, convention, tradeshow or event in the city. Check out some of our favorite spots to get a breath of fresh air, stretch out on a yoga mat or go for a jog. The Commons, as the park is known locally, is a 6-acre park in the middle of downtown on the site of the former City Center Mall. Highlights include a state-of-the-art stage, with regularly scheduled free performances in summer months, carousel, cafes, bocce courts and more. Free fitness classes during warmer parts of the year are a great option for getting out and staying active during a trip. Goodale Park, just one block from the Greater Columbus Convention Center (GCCC), is the oldest in the city and surrounded by the charming architecture of Victorian Village homes. A scenic pond, tennis courts, ball diamonds and playground are an added bonus to the beautiful skyline views found in this serene 33-acre space. Having recently added 33 new acres of greenspace, the Scioto Mile now offers 175 acers of parkland along the Scioto River through downtown, from the Arena District to the Brewery District, less than one mile from the GCCC. An integrated system of parks, boulevards, bikeways and pedestrian paths also features an interactive fountain and performance stage where visitors can cool off and catch a concert during summer months. Those who don’t have a bike can easily rent one from CoGo, Columbus’ bike-sharing program. Interested parties can also kayak or Stand-Up Paddleboard (SUP) along the river and during the summer, local yoga studios offer SUP yoga classes. The Scioto Audubon, accessible via trails along the Scioto Mile, is a 120-acre, nature-filled park on the southside of downtown. Many kayak and SUP excursions end at this major bird migration stopover point. The park offers the country’s largest free outdoor climbing wall, sand volleyball courts, spacious fields, a 10-challenge mud run-style obstacle course, fishing, bird-watching and much more. An overlook deck atop a water tower offers a scenic view of the park situated against the downtown skyline. 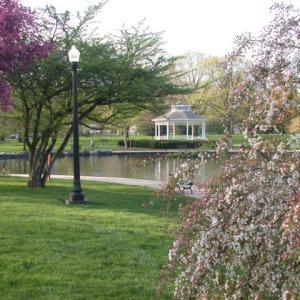 The city’s second oldest park, Schiller Park, is a 23.5-acre urban oasis in the middle of German Village, just south of downtown, offering beautiful gardens, a fishing pond, walking trails, fountains, a community center and an amphitheater that hosts Shakespeare in the Park performances on summer weekends. Topiary Park is a quiet, relaxing spot next to the recently renovated Columbus Metropolitan Library that features landscape plants artistically trimmed to recreate a in topiary Georges Seurat’s “A Sunday Afternoon on the Isle of La Grande Jatte.” It is the only topiary interpretation of a painting in existence.